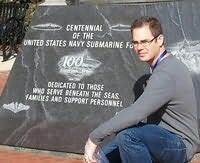 John R. Monteith is the award-winning and best-selling author of the Rogue Submarine novel series. His newest book, Rogue Enforcer , published by Stealth Books in June of 2014, joined the other four books in having reached Amazon's best seller lists in multiple categories, including Genre Fiction > War, and Action & Adventure > War & Military. Stealth Books publishes the complete Rogue Submarine series: Rogue Avenger (2005), Rogue Betrayer (2007), Rogue Crusader (2010), Rogue Defender (2013), and Rogue Enforcer (2014).